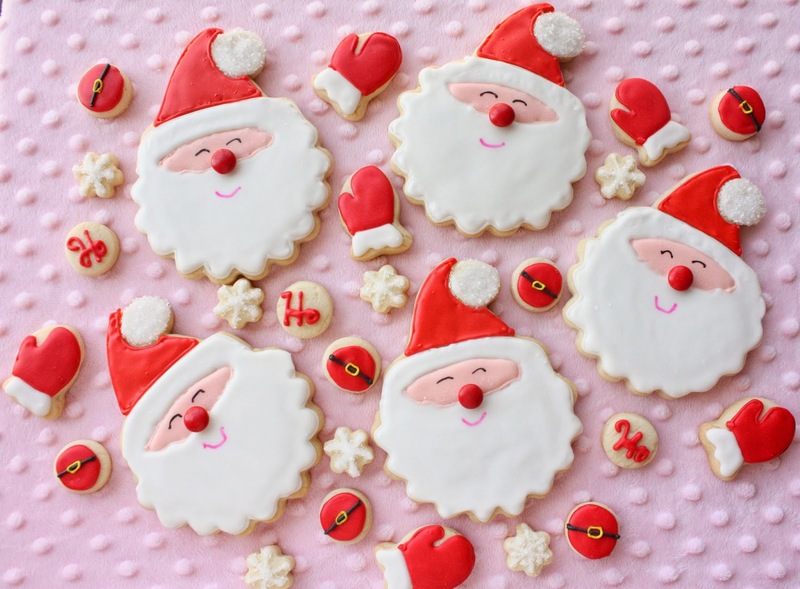 Santa is strictly Christmas so I was happy to be able to make these cookies. 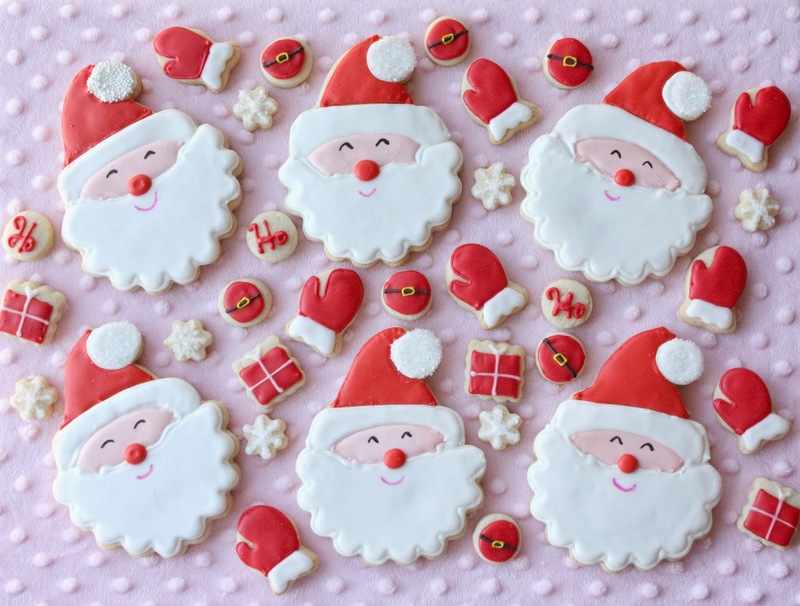 The smiling Santas were inspired by this design from the talented Amy of Living Locurto. So cute! I utilized a bit of cutter creativity to achieve this Santa design as closely as possible. I had a Santa hat cutter and a scalloped, round cutter on hand which merged together nicely. 1. 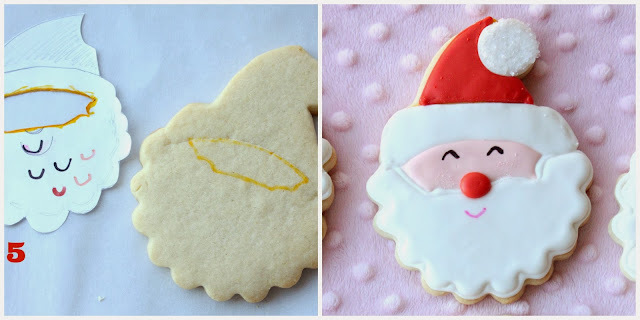 From the rolled out dough, cut out a Santa hat and a scalloped, round shape of similar size. 3. Position the altered hat on top of the scalloped, round cut-out until it looks satisfactory. (I counted the scallops so that I could make each Santa as similar as possible.) Use a small, sharp knife to cut away the excess dough. 4. Position the hat into the newly formed spot on top of the scalloped round and press them together gently. Bake the cookies. I had a lot of fun with this design and they ended up being generous size cookies. I was happy about that because these cookies were sent to Melissa of Melissa Joy and Fanciful Cookies. She was the highest bidder as part of a benefit bake sale organized by Tina of Pinay in Texas Cooking Corner for typhoon relief in the Philippines. Tina did a great job and met her goal for funds raised. 1. 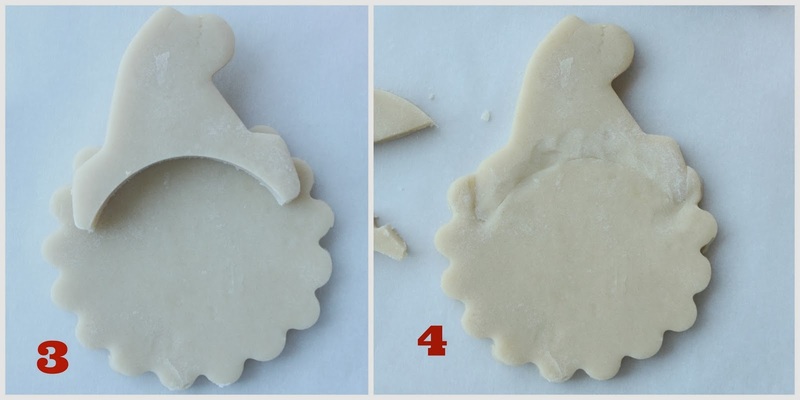 Roll out the cookie dough and prepare the cookies according to steps 1-5 above. 2. After step 5, use some royal icing and a #2 tip to outline and then fill, the face section. (I used royal icing with a drop of pink royal icing for the face color.) Let dry for about 20 minutes and then use the white royal icing to outline, and then fill, the beard/hat rim, and the hat's pom pom sections. (Add the white sanding sugar to the pom pom while the icing is still wet.) Let the white royal icing dry for a few hours hours (or overnight). 3. Using the red royal icing, outline and fill the hat, and then the nose. (For some of the noses I used a red m&m. It was easy, looked cute, and I didn't have to worry about the red "bleeding".) Let dry completely. 4. Using edible marker, add the eye details and the mouth. adorable Sue, always love when cookies cutters merge to make new ones! Hope you have a very merry christmas! So darling Sue. 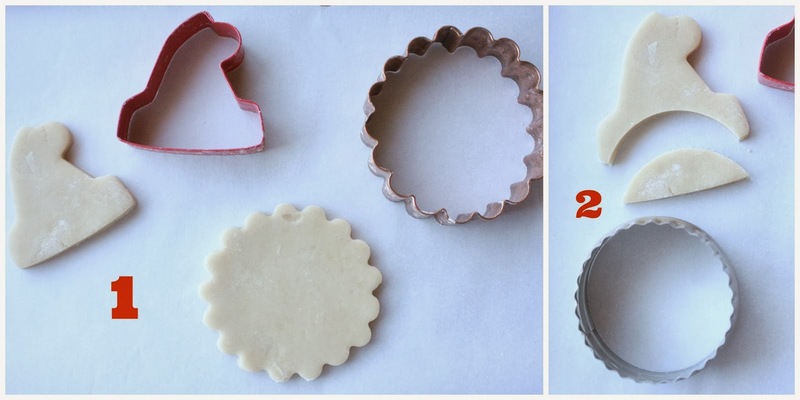 It's great that you utilized cutters you had to make a new cookie. Santa's adorable. You did an excellent job in icing those cookies! 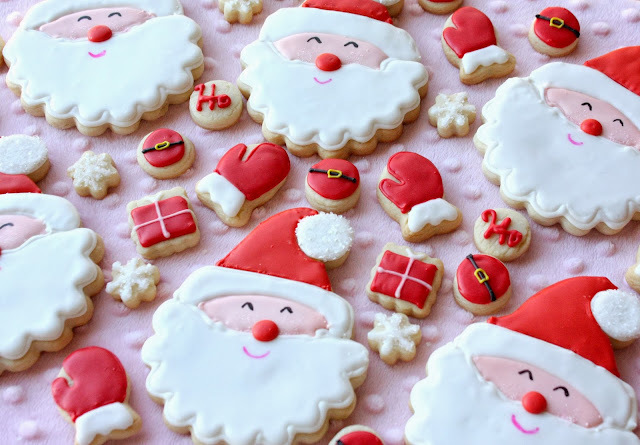 I can`t believe that these are cookies! They look like toy figures! I guess that in order to be able to create such cooking painting skills are needed! Was it difficult for you to cook them? These cookies make me smile and those mini's are just too cute! Merry Christmas! Sue, they are even more adorable in person! I know everyone always says that, but it's true...and they are delicious! The cookie admiration is mutual. :) Have a wonderful holiday and hope you get to spend some time with your munchkins!